The Catalan giants Barcelona welcome the visit of Los Blancos Real Madrid in one of the most inconsequential El Clasico in recent times, the Ernesto Valverde’s side is already crowned La Liga Champions while Zinedine Zidane’s charges already know that they will likely finish in the third position which guarantees Champions League football next season. Real Madrid will be heading to Catalonia brimming with full confidence after making the UEFA Champions League final for the third consecutive time and on the verge of winning Europe’s elite club competition for an unprecedented third time in a row. Barcelona have been ruthless this season in the La Liga, they have remained unbeaten so far in the league, and if there is one team that is capable of tarnishing that unbeaten record then it has to be Real Madrid, nothing will please Madrid fans more than to put a dent on Barcelona’s title-winning campaign with a defeat at the Camp Nou on Sunday. Valverde will be hoping to maintain the Catalan’s unbeaten run and create an ‘Invincibles’ team. The Argentine forward Lionel Messi has been great as always, he played a role in 44 of Barcelona’s 87 goals in the La Liga this season and has been highly instrumental to Barcelona’s total dominance of the league in this campaign. Messi was crucial in the El Classico’s reverse fixture in December last year, when he scored two sumptuous goals to help Barcelona to a resounding 3-0 win in the Spanish capital. Although the Catalan club suffered a shocking Champions League exit at the hands of Roma, they have bounced back to claim a Spanish double by winning both to the Copa del Rey and a 25th league crown to cap a great season. Barcelona’s shameful exit in the Champions League will likely scar Valverde for months to come, but the coach will be itching to cap off an impressive first term in charge by finishing as unbeaten La Liga champions. A league double over fierce rivals Real Madrid will be a perfect parting gift for departing club Captain and legend Andres Iniesta to mark the end of a glorious club career for the Spanish international. Barcelona Captain Andres Iniesta will be hoping to shake off a minor calf problem as he bids to start in what should be his last El Classico as a Barcelona player. Philippe Coutinho should also be a part of the hosts’ midfield, sitting alongside Iniesta, Ivan Rakitic and Sergio Busquets. Both Luis Suarez and Messi are expected to lead the line as usual. Zidane has made a few comments in the press suggesting that he wants to be at full strength for the trip to Catalonia. Madrid is likely to start with Ronaldo and Karim Benzema in the attack, while Isco could play just behind the front two. Dani Carvajal remains out with an injury picked up in the Champions League, meaning that Lucas Vazquez may stand in again at right-back – if not, Achraf Hakimi may feature. Raphael Varane might also sit out as he continues recovery from a slight knock. Barcelona ended last year with a 3-0 thrashing of Real Madrid at the Bernabeu with Messi, and Suarez both scoring for Barcelona in a convincing win. That victory ended a two-game losing streak against Los Blancos, who won both legs of the Supercopa de Espana to claim a 10th title at the expense of the Catalan side. The last five competitive meetings between both teams have ended in two wins each and one draw. 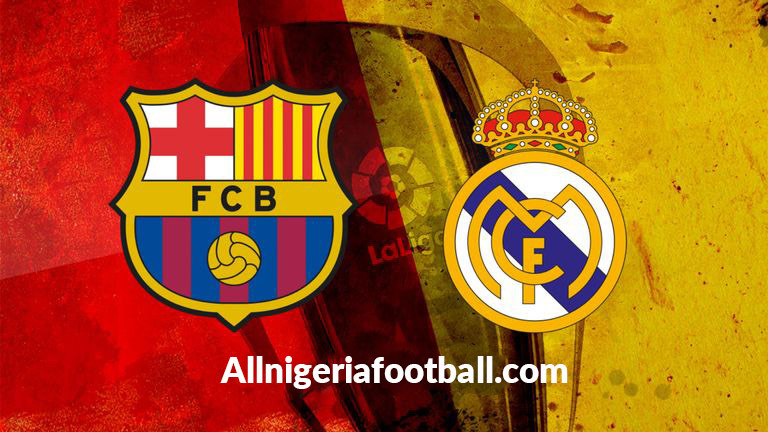 Take nothing away from this match, let me remind you that this is still an El Classico, regardless of Barcelona winning the La Liga title and Madrid’s focus firmly positioned at winning the Champions League for the third consecutive time, none of these teams will want to lose an El Classico, it is always a feisty affair and this encounter will not be different. Barcelona will be keen to preserve their unbeaten run in the league and Madrid will want to spoil the party at all cost, this promises to be an exciting and tantalising match. Barcelona has been the better side in the course of the season but, Madrid has shown that they are the boss when it comes to European competitions. However this El Classico is a La Liga match and Barcelona seem to have an edge here, our prediction is a hard-fought 2-1 win for Barcelona.